Abby Quinn eagerly awaits childbirth but feels haunted by dreams where she suffers a miscarriage. When she decides to rent a room to a mysterious stranger, she realizes a chain of events that will unleash the end of humanity. Before 1990’s Ghost made her an enormous star and opened the doors for “A”-list titles, Demi Moore mostly toiled in ensemble films. 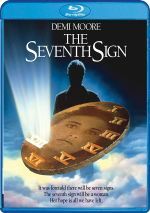 One pre-Ghost exception exists, though: 1988’s The Seventh Sign, a supernatural thriller that credited Moore as the lead. Along with her husband Russell (Michael Biehn), pregnant Abby Miller (Moore) rents out a room to mysterious David Bannon (Jürgen Prochnow). She already frets over the possibility of miscarriage, but the enigmatic David adds to her worries, as she suspects he hides secrets. A mix of strange events occur, and eventually it becomes apparent that David pursues matters that appear to herald Judgment Day. Abby finds herself wrapped up in this as she battles for the survival of her family – and humanity at large. As noted earlier, Ghost became Moore’s commercial breakthrough, and she never again threatened to top its $217 million in the US. Moore acted as part of an ensemble for her handful of other hits, and when she took on the main lead, she tended to flop. That occurred with Sign, as it failed to find an audience. Even by 1988 standards, its $18 million US gross disappointed. As did the movie itself. Going back to 1988, I maintain a vague recollection of the film as something I thought looked good but that didn’t live up to its potential. Watching Sign again 30 years later, I realize why I don’t remember much about it. The film offers a wholly forgettable affair with little to stand out from the crowd. Not that I can call Sign a truly bad movie, and that might be a negative. If Sign brought us a terrible effort, it could generate some unintentional laughs and entertainment. Instead, Sign feels consistently mediocre and without much to bring it to life, though the basic story comes with potential – I guess. As depicted, the movie keeps the narrative loose enough that it becomes tough to attach to it and see where it could go in a positive manner. As a result, we wind up with a somewhat rambling tale that fails to connect in a vivid manner. Though it tries to tie together various characters and themes, the script can’t link them in a meaningful way. This means the movie ambles along in a lumbering way and it doesn’t come to life. Every once in a while, the film threatens to show some spark or kick, but then it quickly lapses back into its narrative coma. How can a story about the potential end of the world become so darned boring? Sign simply lacks any form of urgency, as it seems persistently dull and lifeless. Moore doesn’t help, as she provides a less than enticing lead. She looks pretty but she shows little emotional range, and this leaves our main character without much depth. Sign remains a professional affair, and as noted, it never lapses into the realm of unintentional “so bad it’s good” comedy. Instead, it winds up as a dull, monotonous affair that fails to exploit its supernatural subject matter in a compelling way. The Seventh Sign appears in an aspect ratio of approximately 2.35:1 on this Blu-ray Disc. Though it occasionally showed its age, the transfer came with strengths as well. On the negative side, edge haloes cropped up in wide shots, and those could become a minor distraction. I also saw a mix of specks and marks throughout the film. While never heavy, they showed up a little more often than I’d prefer. Otherwise, the image satisfied. Even with the haloes, sharpness usually looked tight and concise, while I saw no signs of jaggies or moiré effects. In terms of palette, Sign opted for a fairly low-key impression that leaned toward browns and earth tones. These didn’t leap off the screen but they replicated the source in an appropriate manner. Blacks appeared dark and tight, while shadows seemed smooth and well-rendered. If not for the moderate impact of the print flaws and edge haloes, this would’ve been a top-notch presentation. As for the film’s DTS-HD MA 2.0 soundtrack, it maintained a modest impact. Actually, stereo imaging worked very well at times, especially in terms of music, as the score spread nicely across the front channels. Effects also used these domains pretty well. The movie didn’t boast a ton of impactful auditory scenes, but the mix managed to blend the material well as these components used the forward speakers in a concise manner. Audio quality seemed positive, with speech that appeared natural and concise. Music demonstrated nice range and clarity as well. Effects felt well-rendered, with material that was accurate and reasonably full. I can’t claim the soundtrack offered much to impress, but it held up pretty well after 30 years. In addition to two TV spots, the disc’s extras revolve around a mix of interviews. In the first, we get an 11-minute, 10-second reel with actor Michael Biehn. Biehn discusses how he got his role as well as experiences during the shoot and his impression of the film. Biehn proves to be frank and funny in this enjoyable piece. Next we find a chat with director Carl Schultz that goes for 20 minutes, 21 seconds. He covers aspects of his career as well as his involvement on Sign. Schultz brings a nice overview of the production. It’s too bad he didn’t sit for a full commentary, as he seems engaging and informative. We hear from screenwriters Clifford and Ellen Green during their 30-minute, one-second conversation. They talk about the project’s origins and development as well as aspects of the script and why they chose to use pseudonyms for it. This becomes another useful look at the production and some controversies. Two actors fill out the last interview slots, as we hear from Peter Friedman (20:13) and John Taylor (10:52). Clifford and Ellen Green also appear during the Taylor reel. In their programs, the actors examine aspects of their careers, characters and performances. Both offer some good information, though Friedman’s chat becomes the stronger of the two by a wide margin. Given its apocalyptic subject matter, The Seventh Sign boasts the potential to deliver a thriller experience. Unfortunately, it never capitalizes on its inherent strengths, so it turns into a sluggish, dull tale. 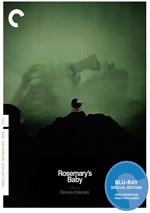 The Blu-ray brings us generally positive picture and audio as well as a small roster of informative supplements. Sign never becomes anything involving.